Back in the sixties I was a member of the Masterton Jaycees. To the uninitiated, Jaycee is an abbreviation for Junior Chamber of Commerce, though back then we knew little about chambers, and even less about commerce. But we were a dedicated band whose basic aim was community service and leadership training. We were more successful at the former. Many community projects were completed, but around 1965 we were at a loss to know what to do next, so we surveyed the town to see what the general populace wanted. We suggested three projects in particular: a soundshell on one of the islands in the park lake - we had already built a bridge to the island and completed the miniature railway there - a coloured water fountain, or a town clock. Overwhelmingly the citizens voted for a town clock. This had more to do with the fact that Carterton had at that time just built their own splendid town clock and the Masterton people were a trifle envious. The town’s previous clock had been atop the post office, but was declared unsound after the 1942 earthquake and was removed and put into storage. The Jaycees could get no enthusiasm for building a clock and took about as much notice of the survey as the three Wairarapa councils are taking of the Local Government Commission’s recommendation that we join a super city. Later in life I joined the Masterton Rotary Club, an older and more conservative version of the Jaycees. In 1975 they were looking for a project to mark their fiftieth anniversary. Those previous Jaycees, who had graduated to Rotary as I had, reminded the rest of the members of the earnest desire of the citizenry of the district to have a town clock. So the good Rotarians, ignoring the fact that almost all of mankind have timepieces attached to their wrists, agreed to the suggestion. The clock from the old post office was deemed unworkable, but the bells were in good condition so they were to be included in the project. The site was chosen; in the middle of the road on the Queen Street intersection with Bannister and Perry Streets. The bewildered Borough Council at the time had decided that upon arriving at this particular intersection from the east or west you could only go one way along Queen Street, either north or south. I have a sneaking suspicion that the traffic design consultants the council employed had previously worked for the Edsel division of the Ford Motor Company. To finance their project the Rotarians amazingly decided to build a house, then sell it, and with the proceeds get someone to build them a town clock. Why they just didn’t build the clock tower itself instead of the roundabout fashion they chose I’ll never know. Perhaps there was something in the water at the time that caused decisions like that one, and disrupting the flow of main street traffic so most visitors bypassed the town; but again, I digress. Keen Rotarian and local solicitor, the late Tom Cunningham, who was at the time developing the top end of Titoki Street, generously donated a section in that subdivision. Architect Neil Inkster, designed an attractive two storied home and another member, master builder Merv. Brown agreed to supervise the construction of the dwelling. Retired gift shop owner Jack Whiteman, who was suffering from the debilitating Parkinson’s disease, chose to stay on site all week preparing for the membership to do the building at the weekend. Mr. Whiteman’s contribution was such that we named the building “The House that Jack Built” and he was awarded a Paul Harris fellowship, Rotary’s highest honour, for his dedication. The house still stands today of course; it looks splendid, and the present owner does it great credit. I can’t say the same for the clock. It, and its appendages, had a checkered career. It was thought that the bells would upset the commerce of the town if placed in central Queen Street so a separate bell tower was built next to the park gates. They were connected by an underground cable to the clock. The clock was a plain-jane of an edifice, its four faces suspended on a scaffold-like structure probably fashionable at the time. It had a unique feature; all four faces told different times. People in the vicinity of the park gates hated the bells. The engineering firm who had designed the structure did not know that you can’t suspend bells directly to concrete with steel attachments; apparently there needs to be seasoned wooden beams in between. The resonance was unbearable and although they only chimed during business hours people working in the area were driven to distraction by the cacophony and in the end they had to be disconnected from the temperamental clock. Another feature of the whole project was to bury beneath the bell tower time capsules that were due to be opened in April in the year 2000. Local folk were invited to purchase a “capsule,” - actually plastic screw top biscuit canisters - and put in memento’s to be opened in the first year of the new millennium. Back in 1975 the year 2000 seemed light years away but twenty five years later when the capsules were dug up the response from those who had buried them was underwhelming. Given the rather short passage of time, the opening was a complete anti-climax. I’m not sure what the moral of this story is; maybe it’s simply that time flies. Certainly the clock went quite quickly. When Masterton’s main street was sensibly returned to its former glory the two-timing four-faced clock was taken down to allow two-way access. No one batted an eyelid. 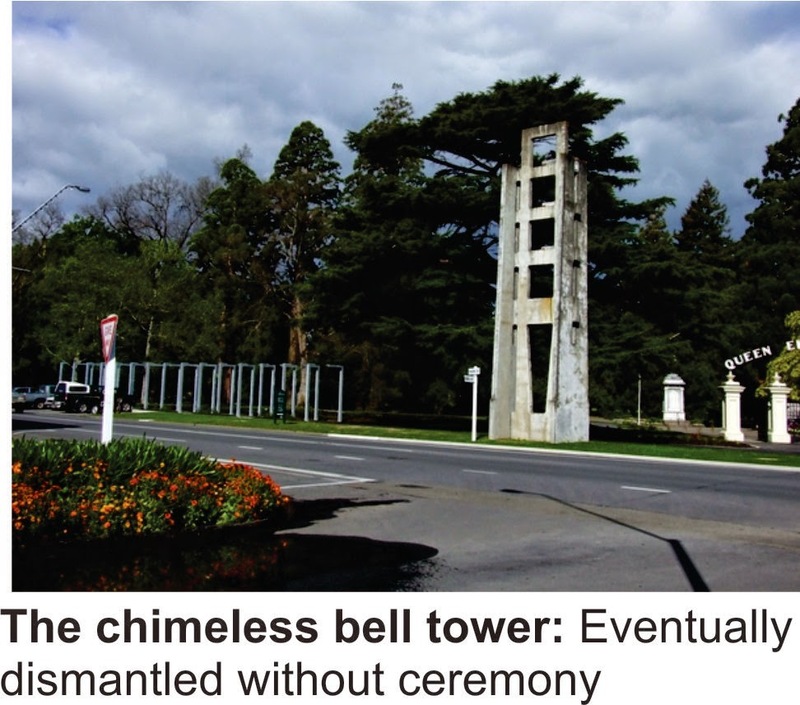 A few years ago the chimeless bell tower was quietly dismantled, largely unnoticed. But I wouldn’t want to belittle the Rotary Club’s efforts to celebrate its fifty year milestone. The club gained tremendously from the skills learnt and the fellowship gained by building a house together, which is probably the real monument to its first half century of existence. The Masterton Rotary Club continues to give sterling, but often unheralded, service to the community. Sadly, the Jaycees went the way of the clock and the bell tower.